San Diego State University’s possible redevelopment of the Qualcomm Stadium property might result in worse problems for Mission Valley if not done right. That was one of the warnings that came out of a Thursday breakfast forum on the valley’s future, sponsored by the Citizens Coordinate for Century 3 planning group. An update, due in 2018, is in the works for the MissionValley community plan and various groups and experts are toying with a variety of new directions, such as creation of a San Diego River Park at the stadium and managing the valley’s traffic congestion through a new approach to land use. Asked if the valley has one or more “hearts,” downtown architect and urban planner Frank Wolden, who has studied the valley extensively, focused on the 166-acre stadium property. 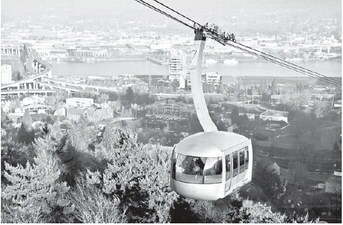 An aerial gondola in Portland, Ore., could be a model for similar transporation in Mission Valley. SDSU’s president recently endorsed the idea of locating a campus annex at the site. Ideas include student housing, a new Aztec football stadium and researchfacilities. “I worry about the SDSU proposal,” Wolden said, “not because it’s not a good idea.” Rather, he said the site shouldn’t be used for a single purpose or isolate itself from surrounding developments. One new experience that drew some attention was installing aerial gondolas that could ferry between the valley floor and the north and south rims. “I’m a very large promoter of aerial trams,” said Nancy Graham, the city planner leading the team to rewrite the community plan. She said the gondolas could help feed into mass transit lines serving the valley and help reduce car traffic. Part of the reworking of the existing plan that dates back to the 1980s is to use a different way to measure traffic instead of counting average daily trips generated by each land use. “If you squint, you can believe it’s Mission Valley,” Graham said, as images flashed on a screen of gondolas in Portland, Ore., and inBarcelona, Spain. Rob Hutsel, executive director of the San Diego River Park Foundation, and landscape architect Glen Schmidt shared concepts for a 60-acre park at the Qualcomm Stadium site. “It’s an incredible opportunity how we rethink Mission Valley,” Hutsel said. Marco Sessa, senior vice presdient at Sudberry Properties, spoke of the latest phases at the company’s Civita residential project. He said he is concerned that numerous requirements are pushing prices above the$500,000 mark for condos and townhomes. Forum moderator Mary Lydon, outgoing executive director of the Urban Land Institute local chapter, urged the breakfast audience of about 60 to focus on reality rather than ideas that may prove impossible to implement. “There are many constraints to Mission Valley and that’s always a part of the conversation,” she said. Andrew Michajlenko, a Gensler architects designmanager and Civita resident, said the valley’s common theme for the future should be built around a “string of pearls” along the river that could be accessed on foot. He also said one of the most challenging goals will be to bridge the river at several spots to provide more north-south connections. Tracey Scott, a senior urban planner at architect Wolden’s Skyport Studio, said the new valley plan also should envision how the area will fit into San Diego’sgreater urban vision. “I think we really need to think about the next 100 years— what is Mission Valley going to become and why do people want to go there and what are they going toget of going there, what kind of benefit,” she said. Hutsel said as chairman of one of the community planning group’s subcommittees, he sees great potential in a number of specific property owner proposals. They include the construction of thousands of apartments or condos at the Riverwalk golf course; the redevelopment of the Town & Country hotel property; and the reuse of the Union-Tribune building and its site once the newspaper staff moves downtown next month. “I think there’s incredible potential in Mission Valley today and I’m looking forward to it,” Hutsel said. 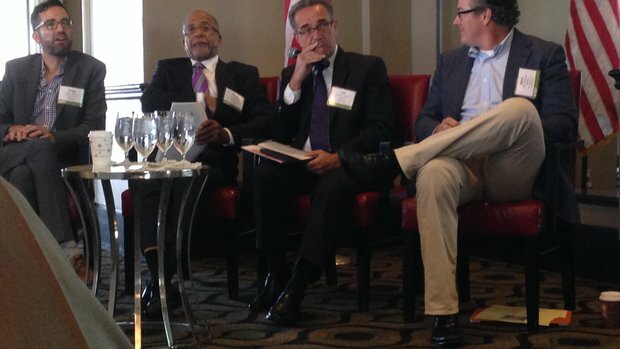 Stadium task force: Plan ‘fair’ to Chargers, taxpayers Can building design make you healthy?